The cosmos teems with a multitude of worlds as well as myriad alternate dimensions of reality, called the planes of existence. It encompasses every world where GMs run their Adventures, all within the relatively mundane realm of the Material Plane. from which the rest of the rest of the multiverse is awesomely made. Negative Energy Plane, and the Positive Energy Plane. These planes surround and enfold the Prime plane. At their innermost edges, where they are closest to the Material Plane (in a conceptual if not a literal geographical sense), the four Elemental Planes resemble a world in the Material Plane. The four elements mingle together as they do in the Material Plane, forming land, sea, and sky. 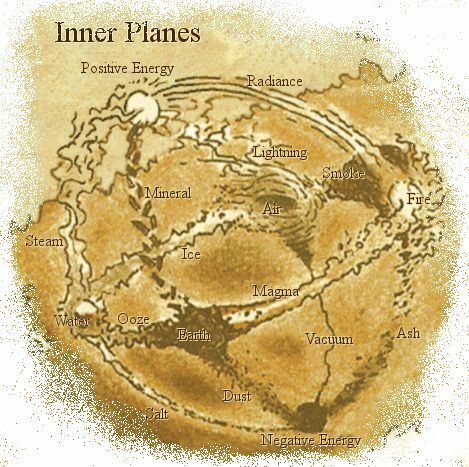 Farther from the Material Plane, though, the Elemental Planes are both alien and hostile. Here, the elements exist in their purest form—great expanses of solid earth, blazing fire, crystal–clear water, and unsullied air. These regions are little–known, so when discussing the Plane of Fire, for example, a speaker usually means just the border region. At the farthest extents of the Inner Planes, the pure elements dissolve and bleed together into an unending tumult of clashing energies and colliding substance, the Elemental Chaos.